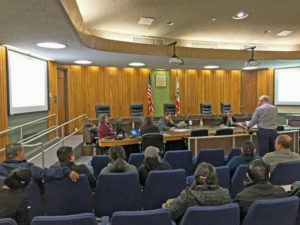 The City of La Puente hosted a community meeting to review the Focused Draft EIR for the plan proposed to demolish the Star Theatre in favor of replacement with condominiums, analysis by Chambers Group, and to elicit feedback from the local community members, stakeholders and interested parties. LAHTF attended the meeting and presented our position on the project. Below is a summary of the meeting and a link to our position statement on the proposed project. John Di Mario, Development Services Director for the City of La Puente, gave a brief introduction of the proposed development of 22 condominium units with parking for 44 vehicles plus 11 guest parking spaces, making it clear that the proposal was submitted to the city by the current owner of the Star Theatre and that it was not a project the city has initiated. The building was purchased by Star Theatre LLC in April 2016, and around one year later the new owners submitted a development proposal to demolish the theatre and build condominiums on the site. An Environmental Impact Report (EIR) was required, the focused draft of which was released in December 2018. Comments are being invited on the Focused Draft EIR until 25th January 2019. A representative from Chambers Group, Inc of Santa Ana gave an overview of the California Environmental Quality Act's requirements for projects of this nature and the role the EIR plays in the planning process, highlighting some of the key considerations for the proposed project. There were a few questions from the floor, generally seeking clarification for sources of some of the statements made in the Focused Draft EIR. In response to one question, the Chambers Group representative admitted that the proposed project will have a significant negative historic and cultural impact on the community. Former Councilmember David Argudo, a lifetime La Puente resident who served as an elected official for nine years until late 2018, spoke in favor of retaining and rehabilitating the Star Theatre. Several other community representatives spoke, several in favor of retaining the theatre and a couple in favor of pressing ahead with the condo project. It was noted by several speakers that the Star Theatre features on the front page of the city's website however it's now being proposed that it be torn down. Project Objectives: the theatre was called "an attractive nuisance" and the proposal makes the assertion that demolishing the theatre and replacing it with condos is required to alleviate the issue, with no mention that reactivation of the theatre would have the same positive effect. Adaptive Reuse with Housing Alternative: this alternative was dismissed on the basis that no local community groups had followed through on expressed interest in utilizing the theatre. LAHTF pointed out that there are working examples of a theatre being integrated into a housing project and in some instances sharing parking, however there was no documented attempt to research this option beyond one local arts group, when in fact there are multiple national and regional organizations specializing in historic theatre restoration and activation. Theatre Rehabilitation Alternative: this alternative was dismissed on the basis of cost. Given the Star Theatre's current status and length of closure, rehabilitation costs could range from $10 million to $26 million. It was confirmed the sole source of these figures was the Cinema Treasures website, which LAHTF pointed out was a crowd-sourced website where users are free to write comments and information in an unmoderated environment. Aside from taking numbers from the Cinema Treasures website, no other rehabilitation estimates were researched. LAHTF discussed two case studies of similarly-sized theatres, dark for a similar amount of time, one of which is being rehabilitated for a cost of $2 million, and advised that the range of $10M to $26M for rehabilitation is absurd. It is the opinion of LAHTF that the adaptive reuse and theatre rehabilitation options were dismissed following an irresponsibly poor exploration of those alternatives, the Focused Draft EIR having a bias favoring the project as proposed. LAHTF have offered to provide assistance to the city and further examples of case studies backing-up the working examples which were cited at the meeting. Comments on the Focused Draft EIR are invited until 25th January 2019. The Focused Draft EIR is available on the City of La Puente's website HERE. The City of La Puente Planning Commission is scheduled to meet on 5th March 2019 to discuss the project, at which representations are welcomed. LAHTF will attend in order to oppose the project as currently planned. To read LAHTF's full position statement on the demolition of the Star Theatre CLICK HERE.